Jamaica villa rentals with chef and butler! Does your taste and budget demand filet mignon and lobster? You can have it. If you are more budget conscious but still want a more upscale dining experience, you can have that as well. 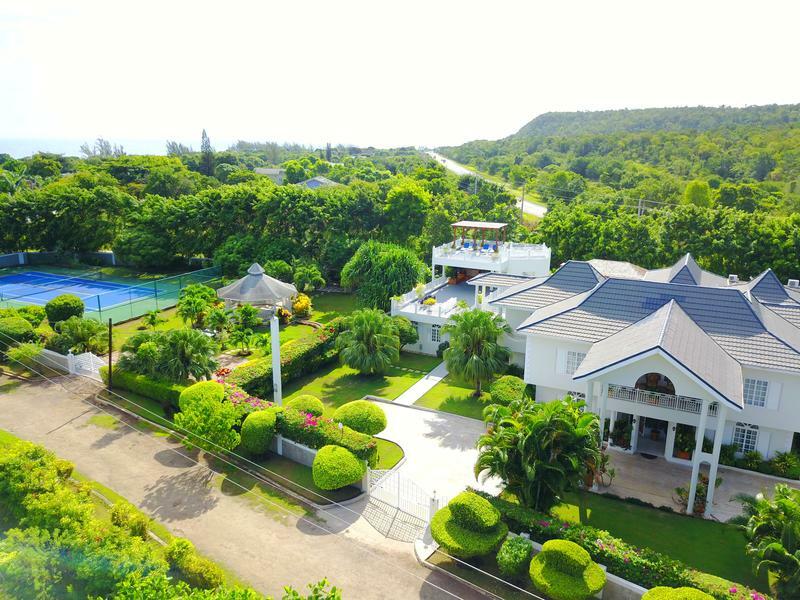 Welcome to your own Jamaica villa rental with chef and butler where you determine your menus with the chef, based on your desires and budget. Why worry about grocery shopping? The villa can be pre-stocked based on your request. For the ultimate convenience, leave meal planning and shopping in the capable hands of your Jamaica villa chef. The setting for meals is as important as the meal itself. There is something just special about having your meals prepared by your private villa chef then served by your own butler with each meal a unique social media worthy experience. For an unforgettable experience have dinner on the roof deck on a dark night with tiki torches all aglow or on a moonshine night when the moon lights the skies. We have the space and furnishings for your whole group to eat together in fine style. Have a home-cooked meal served in one of our spacious dining areas . . . formal dining room, indoor patio, gazebo by the pool, or rooftop terrace . . . all without you lifting a finger! To the extent possible, we use fresh, local ingredients, based on what is in season, to create menus that are distinctly Jamaican with an international flair. Let the spices and the flavors introduce you to Jamaica’s rich culture and heritage through food! 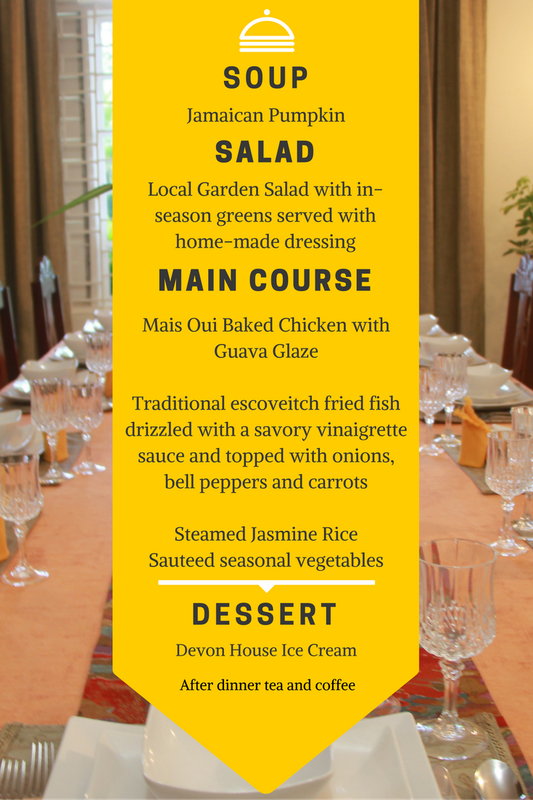 Comparable meals offering similar quality and service cost significantly more than what you will find at the villa. Plus, you have the added inconvenience of driving to restaurants and waiting for service. You will have to go to a really high end restaurant to top the service at Mais Oui. There is a unique Mais Oui Jamaica villa rental experience that we do not post on our website. (We would hate for the person you are trying to surprise to see it.) Ask us and we will gladly share. Seriously, this is not a gimmick. It is perfect for private marriage proposals, special anniversaries or any special experience for a couple. All meals are served family style as they would be in a private home. Buffet, as well as plated, service is also available.To enhance the experience, up to two entrees are prepared for dinner. Option 1. The villa is stocked by the staff on guests behalf. Guests reimburse for purchases. Further purchases and shopping as needed and coordinated with chef. Maximum flexibility of choices. Option 2. Pre-paid add on Meal Plan: 3 meals per day based on our menus. Some flexibility of choices. "Exquisite services, freshly caught fish and lobster, jerk chicken were just some of the items. Also, these were the most punctual meals we have experienced. The tables were beautifully set with a variety of colorful linens and table collections." Ann P. Green Bay, WI. Jamaica villa rentals with chef and butler. Book now. The service will simply be "Wow"!